The mysterious sightings of airships that newspapers in America and Europe reported upon began in November 1896, with the massive sighting of a huge cigar-shaped aircraft over the city of Sacramento (California), which was seen by many. Days later, newspapers reported, from different states, other bizarre and impressive aircraft flying across the sky with impunity. 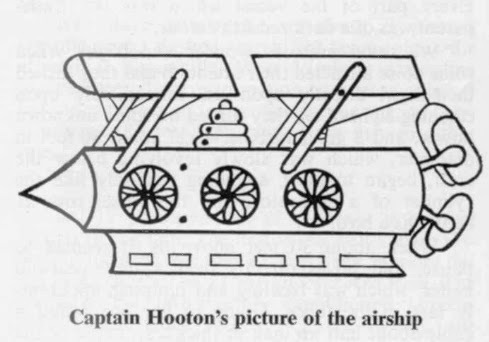 The chroniclers of the time described these flying machines as resembling enormous airships, with a cabin at the bottom and armed with powerful "reflectors" which alarmed witnesses. Contemporary researchers such as Robert G. Neely Jr., Donald Hanlon and Jacques Vallee, have been able to find more than two thousand newspaper accounts, between the years 1896-1897, that referred to the appearance of such strange aircraft in the United States, baptizing those sightings, as the Air-Ship Wave. We must take into account, before proceeding, where we are situated at the end of the nineteenth century. The first flight airplane flight by man was by the Wright brothers on December 17, 1903, and the first American dirigible, the California Arrow of Thomas Baldwin, did not fly until 1904. It is therefore assumed that in 1896-97 no human apparatus, except balloons, interrupted the smooth flight of birds. Aeronautics experts as Charles Harvard Gibbs-Smith, belonging to the Victoria and Albert Museum in London, ruled out the possibility that the Air-Ships were from the human hand. During the two years mentioned, there were numerous sightings of "airships" that plied the skies at speeds estimated between 5 and 340 km / hour. Researcher Jacques Vallee stated, "the aircraft had typical activities similar to that of UFOs, were immobilized in the air, throwing probes, abruptly changing course, or altitude, going at high speeds, circling, landing and taking off, and sweeping the countryside with powerful searchlights." But those devices, unlike our modern UFOs, seemed to be at the forefront of technology by the end of the century. Ignacio Darnaude Seville, in his brilliant article "The Mysterious Wave of 1896-1897," said on this subject: "Many flying machines of varied size, appearance and features [performed] a vast array [of] histrionics in the skies of the emerging world powers, showing dilapidated mobile wings beating the air like birds, canvas sails to catch the wind, propellers, circular wells such as river vessels, gas balloons, stabilizers, rudders, steam engines, motors electric and gasoline, multicolored lights, and other simulated mechanical devices which may be attributed to the primitive technology in vogue in the late nineteen [hundreds]"
"What is truly disconcerting about the air-ships of 1897," wrote the dean of ufology, Antonio Ribera, "is the ”Victorian era” patina and Jules Verne resemblances." Whoever wants to get an idea of their appearance, according to eyewitness accounts, you can turn to two works by Jules Verne: Robur the Conqueror and Master of the World. "In these cited works of the famous French writer, is described, in detail, an aircraft called the Albatross which remarkably resembles the "airships" seen in the American Southwest. Note that Verne’s books were published ten years before the events of the Air-Ship wave (1886). How could the French novelist anticipate future events? Who or what made up the crew of these "impossible" flying machines? What intentions did they have? In Omaha, Nebraska, there were dozens of sightings of the wonderful flying machines that seemed to be moving from a starting point in California, moving to the east, causing surprise among the thousands who saw it. As reflected in the dozens of press stories, the city of Omaha, was a central to the continual comings and goings of the aircraft ghosts, as many reporters reported it. One event that had broad impact was reported on March 28, 1897, when a large crowd gathered in the street to see a great light flying at low altitude. Almost the entire population of Omaha was witness to this inexplicable incident, which was referred to in almost all gatherings of the region. "Omaha residents should distinguish the strange device (the Albatross) (...) a fact that newspapers were going to discuss in the union." In this paragraph the Jules Verne cites the city of Omaha and the journalistic follow-ups that were aimed at their aircraft, the Albatross, which like the Air-Ship, were continuous and daily on newspapers’ front pages . "As expected, all the newspapers spoke of the issue (Albatross sightings), and treated them in all their forms, clarified and obscured, told true or false facts, filled [readers] with alarm or reassured [them] ... "
April 13, 1897 The Saint Louis Globe Democrat, reported that the engineer of the locomotive 950 of the mail service, Mr. F. L. Bullard, had watched dumbfounded as one of these ships approached his convoy, passing with ease, even though the train was going at full steam, and then the Air-Ship disappeared into the distance. It was not the only time a passenger train saw the fleeting passage of an Air-Ship, which seemed to enjoy overtaking the fastest land vehicles at the time. April 20, 1897, about 2 a.m. in the town of El Paso (Texas) a terrified witness said he saw a huge flying machine in the form of pure circular windows lit with the help of two powerful headlights that illuminated entirely his steps as if it were daylight. A similar case occurred in Oakland a year earlier, which reported the presence of an object, provided with wings, projecting a powerful beam of light on the ground. As we see, it was very common for the Air-Ships to deploy powerful spotlights to illuminate the pitch-dark night and surprise witnesses, who would never think that this great light could come from the stars. "Two bright headlights [lit up] plazas, piers, gardens, palaces and sixty thousand houses in the city, and threw light rays from one horizon to another…" ... detailing the Frenchman’s airship’s visit to Paris, as the crew of the Albatross also liked to scare observers with the Albatross’s powerful spotlights. There were dozens of opportunities during which the surprised witnesses could approach the Air-Ships, and observe their crew. Most of the time the pilots were just like us, both women and men, including several incidents in which there were children and the elderly in these aircraft. And the crew of these aircraft often engaged in conversation with witnesses. Generally the witnesses approached the aircraft on the ground and checked it. As they approached the crew, they spoke good English (except for several cases in which an unknown language was spoken). They claimed to be "inventors" air testing a new prototype, so it did not raise too much suspicion. They said it takes many years of experimenting with aerial devices and soon they would patent the machines. To justify stopping on the ground, these strange characters often asked for water, explaining that it was a rest stop or that they were "repairing" the aircraft. April 12, 1897, near Green Rideg Girard (Illinois), a large group of miners saw an unknown object which landed three miles north of Green Rideg and four miles south of Girard. The engineer in Chicago for Alton Railroad, Paul McCrame, stated that he came close to the unit, and saw a man “repairing” the machinery. Traces were found over a wide area. The object was elongated like a ship and had a roof and a double canopy. The ship left for the north. Robur, Verne's character also suffers the ravages of the damage to his aircraft “to repair at least [the] bow thruster; the Albatross staff, knowing that there was no time to lose, immediately set to the work. " On one occasion, April 22, 1897, after the landing of one of these devices in Rockland, an occupant who gave his name as "Smith" told the startled witness, "I need some lubricating oil and a couple of chisels. And I need some copper sulfate. I guess the nearby mill will have the first two items and the telegraph operator has the copper sulfate. Here's a ten dollar bill, pick up these items and keep the change for the inconvenience." John M. Barkclay, which was the name of the witness, asked "Mr. Smith" from where they came and got this elusive response: "Everywhere, but we will be in Greece after tomorrow." The witness’s dog was barking furiously outside the house in the presence of Air-Ship. It is well known that many times animals, especially dogs seem to predict the arrival of UFOs, as well as the Air-Ships. Jules Verne added this enlightening information, "Singular instinct! These beings (dogs) felt the flying machine (the Albatross) pass over them and uttered cries of horror at his proximity." April 14, 1897, in Cleveland (Ohio), Joseph Singler, captain of the Sea Wing, was fishing with S. H. Davis, of Detroit, when they saw on the lake what they thought was a boat about 13 meters long, with a canopy. A man of about 25 years, with hunting jacket and cap, was fishing from the bridge of the object. Beside him were a woman and a boy about 10 years. When the Sea Wing moved closer to the machine, the huge rose-colored globe rose to a height of 150 meters and made several circles before leaving. "The Albatross staff, imagining the fun you could provide fishing from the apparatus could not hide their satisfaction (...) One hour of fishing [was] enough to fill the aircraft, which turned to the north." May 6, 1897, two law enforcement officers, called Sumpter and McLenore, were riding northwest of Hot Springs (Arkansas) when they saw a bright light in the sky. Then later, they saw the light again, this time down to earth. Their horses refused to advance. They saw two men armed with lamps. Sumpter and McLenore seized their rifles, and called out to the unknown and were told that it was traveling the country. In the clearing stood the silhouette of the machine, about 20 feet long. Beside her was a woman with an umbrella. It was raining and the youngest of two men took care to fill a bottle with water. An older man, with a beard invited the agents to check around on the ship, [before going] to "a place where it rains." The witnesses returned to the same spot 40 minutes later and saw nothing. From Verne: The crew of the Albatross, "had down 10 meters from the river, where it was parked. Then thanks to a rubber tube pulled out of the aircraft (...) They worked to procure water." Jules Verne describes, throughout novel, the course of the Albatross through different states. The characters kidnapped by Robur, Phil Evans and Uncle Prudents, when they looked from the deck of the aircraft, saw different cities and geographical features. The hostages begin to describe the places they saw from the air, after their entry into U.S. territory from Canada, to leave for California. With the aid of maps of varying vintage and historical documentation we can follow the " air route " described by Verne in his novel. ﻿Of the 12 states visited by Robur’s Albatross in the novel: : NEW YORK, PENNSYLVANIA, OHIO, INDIANA, ILLINOIS, IOWA, NEBRASKA, THE DAKOTAS, WYOMING, UTAH, NEVADA and CALIFORNIA,, 8 were later overflown by the Air-Ships (states underlined). After the months of November and December 1896 and March, April and May 1897, we never heard of the strange and unusual aircraft with their inventors again. But most disturbing of all is this question, Is the amazing of Jules Verne sketching between the lines, almost perfectly, what years later would happen in the United States? Again it is clear that the French novelist was a man ahead of his time or a perfect clairvoyant. 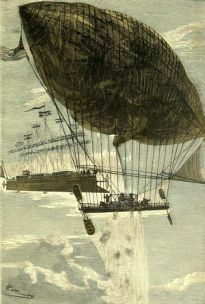 Many of the places described in Verne's work as a stage for his Albatross flights are the same decades later that were flown by the Air-Ships. In fact, coincidentally, the last point of American geography visited by Robur, is precisely Sacramento (California), the starting point of the Air-Ship wave. Remember that the novel came to public light in the month of November 1886, and the beginning of the mass sightings of air-ships in November 1896. More accuracy cannot be ordered. What never ceases to amaze, obviously, is the complexity of the UFO phenomenon that seems to hide behind a disguise to avoid any kind of study. As researcher Jean Robin said, "Each of the UFO-phenomena manifestations of U.S. aircraft in the 90's of the 19th century, the mystery aircraft in Scandinavia in the 30's, [the ghost] rockets of Sweden in 1946, today's era of UFOs are a step ahead of the technical advances of the time. The core problem is the projection of a false belief system, a little beyond existing beliefs." Vallee adds: "Arguably, if [we’re] dealing with a higher type of consciousness, it is entangling us in certain games (...) we are witnessing a truly remarkable form of consciousness, which has a great sense of absurdity and of humor." "My experiment is finished. Now is not the time to rush to progress further. Science should not get ahead of the customs. It is evolution, not revolution that we should seek. In a word, we should not be before our time. I have come too soon today to understand your conflicting and divided interests. The nations are not yet civilized enough for union. I go, then; and I take my secret with me. But it will not be lost to mankind. It will belong to you the day you are educated enough to profit by it and wise enough not abuse it. The basic structure of the Albatross is of a boat. The Air-Ship is described often as a ship. Likewise, in both cases is described the existence of a rudder as a tool of governance of the object. The Albatross had two powerful spotlights in the bow, to light around it. The Air-Ship has been described on numerous occasions with two bright lights. The energy that propelled the Albatross is electricity. Sometimes the alleged inventor of the Air-Ship named electricity as their source of motor. The noise that produced both aircraft was also very similar. The Albatross and Air-Ship both used an anchor for their approaches and landings. Albatross speed in the work of Jules Verne was 200 Km / hour, with the speed of the Air-Ship, according to findings of contemporary researchers, between 5 and 340 km / hour (200 miles per hour). 1. Albatross crew is bearded. Robur has a beard, like much of the "scientists" in command of the Air-Ships. 2. Uniform. The crew of the Albatross, as the illustrations accompanying the original edition shows, were dressed as sailors. Clothing observed in some individuals onboard the Air-Ships. 3. Crew. 8 men in the case of Albatross; also seen in numerous sightings of the Air-Ship. 1. The trumpet of Tom Turner. Robur's boatswain liked to play the trumpet, which astonishes the witnesses before the passage of Albatross. Different musical instruments, including a trumpet were heard on board of the Air-Ship. The crew of the Albatross stock up on food fish in rivers and seas. Several witnesses observed the Air-Ships near a river, and its occupants were fishing peacefully. many of events collected by the newspapers. Like the fishing action, obtaining water is part of the crew activity of the Albatross and is repeated by the mysterious occupants of the Air-Ships. Messages are thrown from the Albatross and sometimes the Air-Ships do the same. The passage over the city is clear in the novel and in the cases recorded for 1896 and 1897, The Air-Ship seen above the same town are abundant. The passage of the city is named in the work and sightings reported on the same town are plentiful as in the case of Chicago. The use is detailed in the novel, when the Albatross flies over Paris (France). The Air-Ship is seen in the city of Paris, Montana. The Albatross over Lake Erie has a perfect replication during the Air-Ship wave.